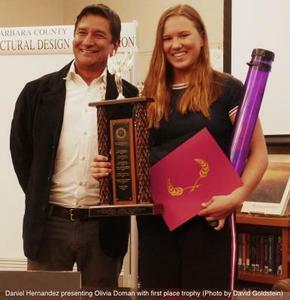 Freshman Olivia Doman took home top honors at the annual Santa Barbara County Architecture Competition, besting a group of older and more experienced finalists. The surprise winner of the Architectural Foundation’s annual Santa Barbara County High School Architectural Design Competition was lone freshman, Olivia Doman. 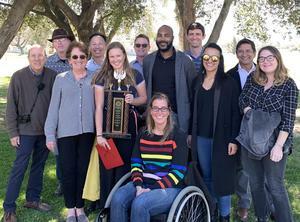 She competed against six seniors, three juniors, and two sophomores, the twelve finalists who presented their work to a panel of four jurors Saturday in Los Olivos. “We haven’t had a ninth grader win it for over seven years,” said David Goldstein, retired architect and founder of the 28-year-old competition. “We gave them a really tough problem this year, and with so many seniors, we figured she didn’t have a chance.” Doman’s name will adorn the legacy trophy which will reside in her school, Santa Ynez Valley Union High School, until next year’s competition. This year’s competition was unusual, and not merely because a freshman took first place. For the first time, the preliminary competition was held in two venues simultaneously, one in the Santa Ynez Valley Union [High School] gymnasium where Doman spent nearly seven hours drawing her solution, and at Direct Relief near the Santa Barbara airport. Each venue on Tuesday accommodated nearly thirty competitors from ten high schools in the county, and their work was judged by two teams of three architects who assessed their work. Six finalists were selected from each venue, and they were brought together Saturday to make a fifteen-minute presentation standing in front of their architectural drawings. Other winners Saturday were Theo Soderman, senior at Dos Pueblos in Goleta, and two honorable mentions, both seniors as well, one from Providence, Gabe Farhadian, and Jessica Ji, from the Dunn School where Saturday’s event took place. The competition was sponsored by two Rotary Clubs, the Santa Ynez Valley Rotary, and the Santa Barbara Rotary Club. Other sponsors included Inklings in Santa Ynez and Tri-Co Reproductiion [six] in Santa Barbara, who donated printing services.